The two monitors, key-off and purge flow, are used to detect malfunctions relating to dtc p0441. The key-off monitor is initiated by the ecm internal timer, known as the soak timer, 5 hours* after the ignition switch is turned off. The purge flow monitor runs while the engine is running. In operation c, the leak detection pump creates negative pressure (vacuum) in the evap system. 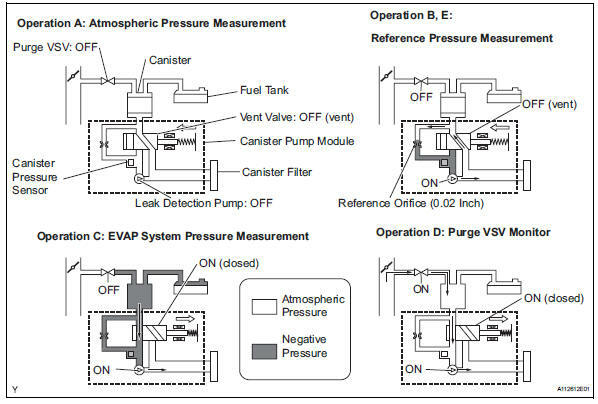 The evap system pressure is then measured by the ecm using the canister pressure sensor. If the stabilized system pressure is higher than [second reference pressure x 0.2], The ecm interprets this as the purge vsv (vacuum switching valve) being stuck open. The ecm illuminates the mil and sets the dtc (2 trip detection logic). In operation d, the canister pressure sensor measures the evap system pressure. 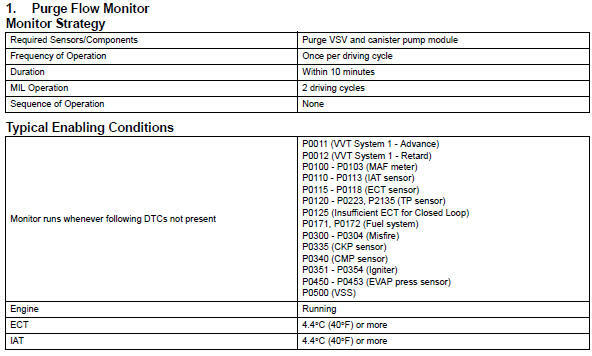 The pressure measurement for purge vsv monitor is begun when the purge vsv is turned on (open) after the evap leak check. 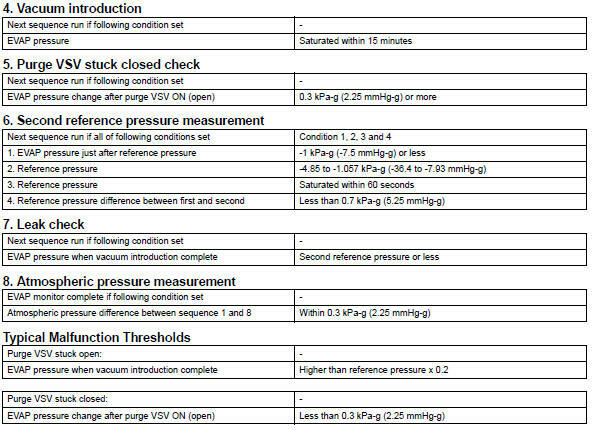 When the measured pressure indicates an increase of 0.3 Kpa-g (2.25 Mmhg-g) or more, the purge vsv is functioning normally. If the pressure does not increase, the ecm interprets this as the purge vsv being stuck closed. The ecm illuminates the mil and sets the dtc (2 trip detection logic). 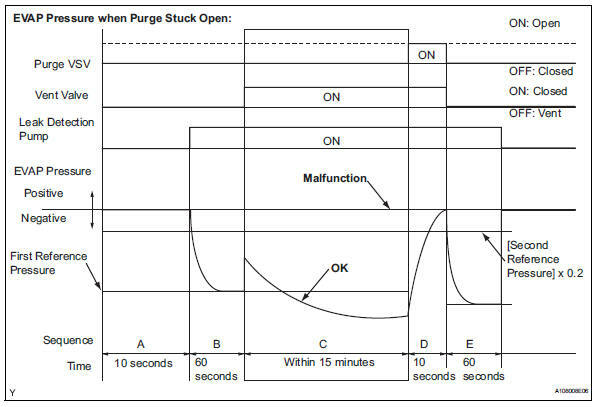 The purge flow monitor consists of the two step monitors. The 1st monitor is conducted every time and the 2nd monitor is activated if necessary. 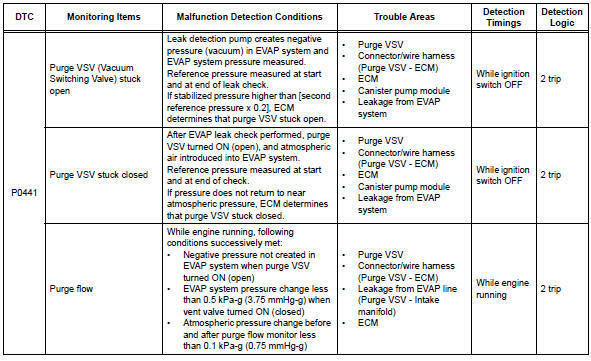 While the engine is running and the purge vsv is on (open), the ecm monitors the purge flow by measuring the evap pressure change. If negative pressure is not created, the ecm begins the 2nd monitor. The vent valve is turned on (closed) and the evap pressure is then measured. If the variation in the pressure is less than 0.5 Kpa-g (3.75 Mmhg-g), the ecm interprets this as the purge vsv being stuck closed, and illuminates the mil and sets dtc p0441 (2 trip detection logic). 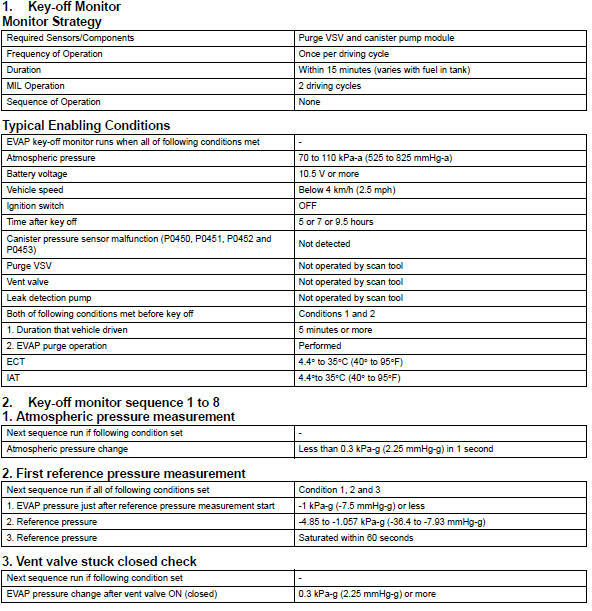 Atmospheric pressure check: in order to ensure reliable malfunction detection, the variation between the atmospheric pressures, before and after conduction of the purge flow monitor, is measured by the ecm.